yoga on high Archives | What Should We Do Today? I don’t consider myself a fitness guru by any means, but it is important to me to exercise regularly. I can tell you that after each of my babies were born, I pretty much stopped exercising for the first year of their lives. It just gets harder. 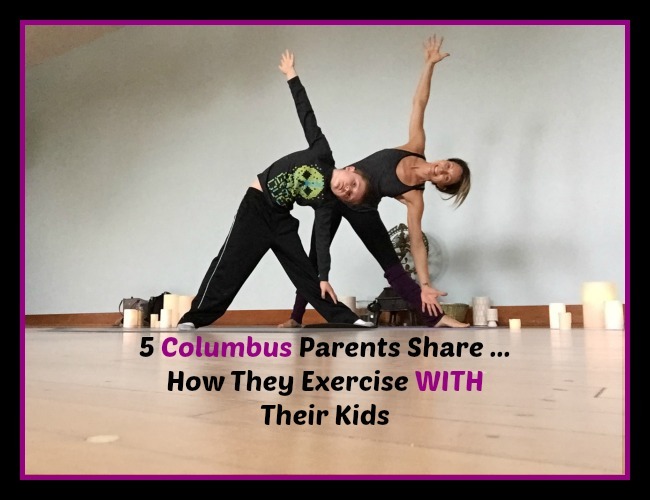 In the past few months, I have been introduced to the following organizations that make it possible to exercise WITH your kids! What I’ve discovered from hearing these stories, is that these opportunities offer a lot more than just a workout! Most of these parents have also found a community of support and friendship! Check them out! I moved to Columbus a year ago for my husband’s job. We didn’t know anyone in the area. I had an 18 month old and was 34 weeks pregnant. I knew I would need to find a village of other moms with little ones as soon as possible. I enjoy working out, but I don’t like having to leave my girls in the gym daycare, especially a newborn. I had been apart of a group called FIT4MOM-Stroller Strides when we lived in Phoenix and thought I should see if there was one in Columbus. I was excited to see there was, and quickly contacted the owner after my 6 week check up. Right from the start, I knew it was a great fit. All of the moms were so welcoming and made me feel like I had known them forever. During the workouts, the instructor gave multiple levels, so I wasn’t intimidated to slowly work my way back into exercising. I was still adjusting to having two kids under two, but the moms were there for me with words of encouragement and advice on those days I didn’t know if I could make it. Now that it’s been almost a year since joining Stroller Strides, I can see how important this village is for my two little girls and me. My oldest is counting and singing the songs she hears, during class and even when we are at home. She asks, “Are we going to stroller strides today, Mommy? Will I get to see my friends today?“ It’s great to see, that not only am I getting in my hour workout and forming friendships, but my daughter is learning and building friendships with the other kids during class and at the play dates following my workouts. She has recently started telling Daddy to “do push ups or burpees with me” when he gets home from work! Additionally, FIT4MOM has monthly Mom’s Night Out events. I have found this to be important to me because I can leave my girls at home, go out with just friends and have some ‘me’ time. 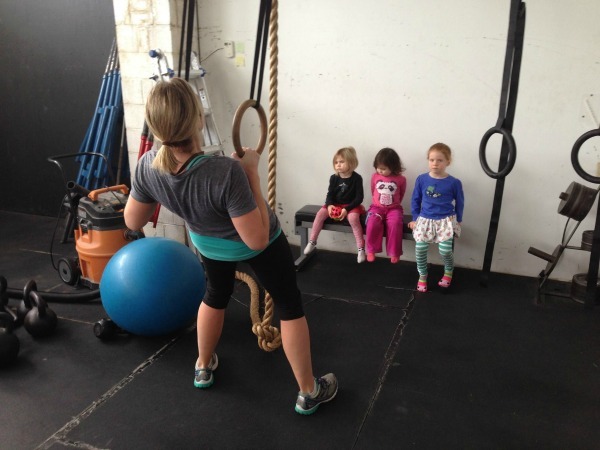 For me, FIT4MOM has everything I am looking for, a workout, play dates for my daughters to interact with other kids, and support and friendship with the other moms, before, during, after class, and at MNOs. Everything I need to have a healthy family and lifestyle. I am thankful to have found FIT4MOM for all of these things! I’m not sure I would have survived with out it! For the past 11 months, my family has taken advantage of the awesome opportunity to explore the outdoors with a fun and supportive group of families through the Columbus OH branch of Hike it Baby. Hike it Baby is a parents group dedicated to getting families together and out into nature with children from birth to school age. My husband, my 18 month old son and I have found the families involved with Hike it Baby to be an amazing support group. We have learned so much from families with older kids not only about how to enjoy the outdoors with our son, but also that the struggles we were going through as first time parents were normal. 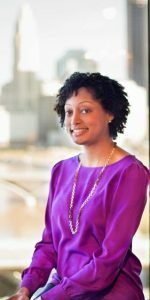 The variety of outdoor events offered, combined with the variety of kids ages, makes for a unique group of parents who are willing to share their successes (and failures) for everyone to learn from. 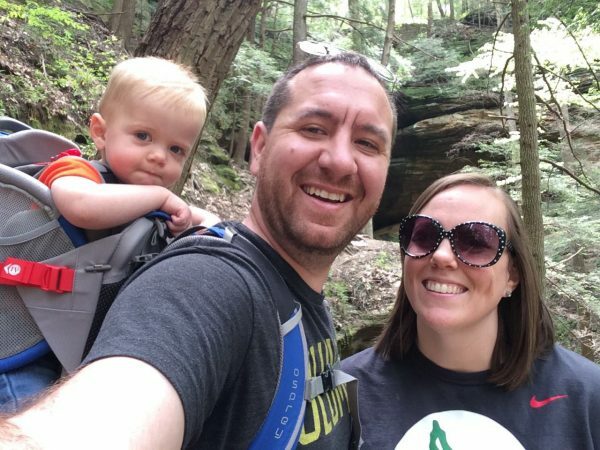 Hike it Baby truly has something for everyone: from hikes through the trails of Hocking Hills to local coffee strolls in the neighborhood to toddler led hikes to park and play events at local parks. Initially, we were hesitant to join a “hiking” group when the Columbus OH branch of Hike it Baby started, especially with a 7 month old child at the time, but because of the welcoming environment of the group, Hike it Baby’s “no hiker left behind” values and the support of all the other families, all our fears were quickly replaced with a sense of community. Now we host hikes as a family and have made so many friends within the Hike it Baby group that it has truly become one of our favorite family activities. Visit their Website for hikes in your area! As a mom and a woman who is interested in self care, I am always on the lookout for ways to accomplish that and instill these habits in my children. So when I saw that Yoga on High was offering a kids yoga class and hot flow class with the amazingly energetic Michele Vinbury simultaneously, my heart leap with joy. In our house we call Sundays, “Sunday Fundays”. It’s a time to tap into nature, be healthy and/or exploring our area. This yoga class is at a later time beginning at 10:30am on Sundays which is nice. If you have AM commitments like church, then it is still doable to add into your day and if you don’t, then what a fantastic way to start a Sunday. It is so close to many other great kid friendly restaurants and parks. 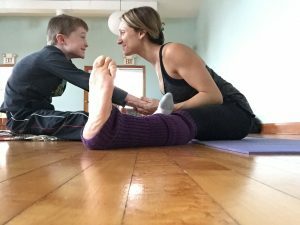 The kids yoga teachers at YoH are so knowledgeable and have helped my sons develop a healthy outlook regarding their bodies, minds and little spirits. How great that while all that is happening for my kiddos that I also can be practicing the same mindful awareness in the room next door. What a wonderful way to be generous to yourself and your family! After 2 kids, I decided it was time to get back into shape. I started on a weight loss journey last summer. The first class I went to was at a park in Gahanna. Mark was the trainer and lots of mamas were there with their kids. I thought, I can do this if I can bring my kids! It was a great, intensive, yet fun workout. I have been hooked ever since. The “SuperMoms” class is amazing! I have really gained a new appreciation for the beauty of working out with kids. No excuses, they can come with you. There is always stuff to do for the kids, they make friends, and you can keep your eye on them, or more than likely they can keep their eye on you, lol. I have met so many new friends, ran my first 5k with them and have been getting in shape the entire time. Mark is a great trainer. He has high but reasonable expectations and he is always willing to work hard to keep you on pace with your goals. If you are looking for something fun and healthy to do today, I suggest it be the SuperMoms class with Mark the Spot Fitness. I promise you won’t regret it! If you’re looking for a fun and fit family activity, look no further than OhioHealth HOOFit walks at the Columbus Zoo and Aquarium.  Take a short “walk on the wild side” as you see various animal exhibits while walking and talking to an OhioHealth doctor and Zoo expert. The program offers education on different health related topics to improve your health. This program is free with your paid admission or membership. It’s a great way to inspire better health for yourself and your family. Big or small, EVERY step counts! It’s so much fun, that your children won’t even realize they’re “working out”. Definitely a win-win situation for busy moms that don’t have the time for a structured workout routine. Preregister and see schedule here, walks begin at 9:30 AM and the last one for this summer is this Thursday, September 15, 2016! Need more ideas? 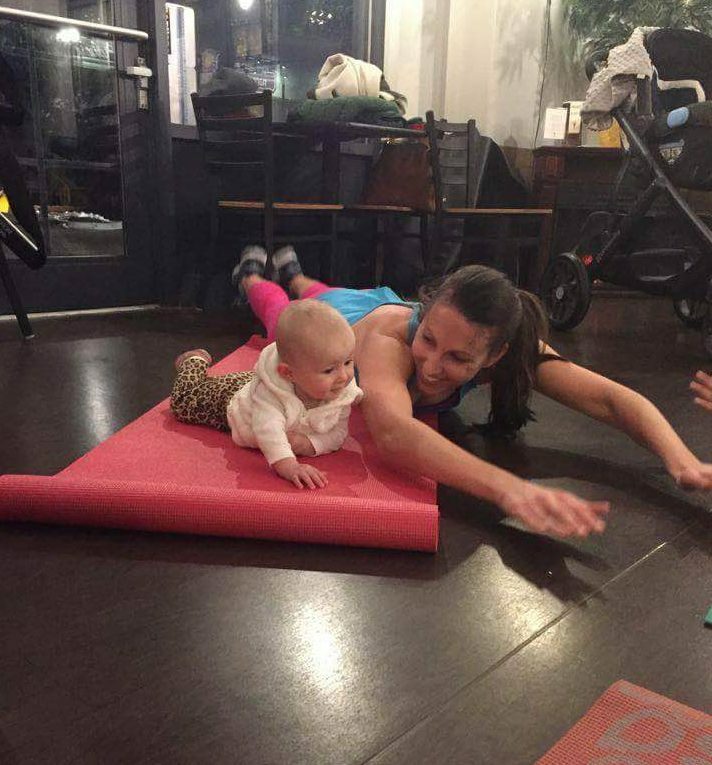 Worthington Parks and Recreation has The Baby Wearing Workout, Piccadilly has Tots and Squats and occasionally, peapod play cafe has Mommy and Me Yoga! If you know of another, send me a message and I’ll add it here!